2007 Routech “Action Line” mdl. 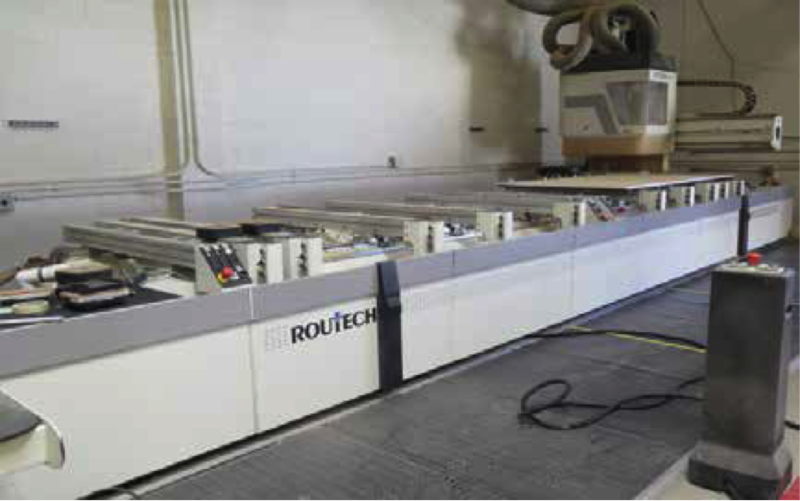 Record 110 AL PRISMA 5-Axis CNC Router s/n AA1-0162264 w/ Routech Routolink PC Based Software and Control Package, 16-Station ATC, HSK-63 Taper Spindle, 49” x245” Work Area, (14) Adjustable Work Supports, Auto Clamping Devises, Vacuum Clamping Fixtures, Becker 7.5kW High Volume Vacuum Pump, Dust Conveyor. Robland Z320 Sliding Table – Table Saw w/ Tiger Stop Automatic Fence System, Straight and Angular Cutting Fence Systems, Scoring Blade, Safety Guards. 2003 Laguna LT-24 24” Vertical Band Saw s/n K3010160 w/ Fence System, 24” x 27 ½” Table. Powermatic mdl. 66 Tilting Arbor Table Saw s/n 8366657 w/ Fence System, 28” x 38” Table, 79” x 98” Table Extension. Delta “Unisaw” 10” Tilting Arbor Table Saw w/ Delta “Unifence” Fence System, 27” x 28 ½” Table, 61” x 111” Table Extension. Hitachi 15” Miter Saw w/ 94” Table Extension. (6) DeWalt Compound Miter Saws w/ Tables. Craftsman 10” Vertical Band Saw. SZ Spray Zone “Crossfire Semi Down-Draft” mdl. SZSDD20SE 201210 Enclosed Spray Booth w/ 14’W x20’L x 9’H Inside Dimensions, 1,000,000 BTU Direct Gas Fired Heater, (2) 2Hp Exhaust Fans, Fire Suppression System, 12-Element Filtration System. SZ Spray Zone “Crossfire Prepzone Semi Down-Draft” mdl. SZ-PSD 20159 Open Face Sprat Booth w/20’ W x 15’L x 9’H Inside Dimensions, (2) 3Hp Exhaust Fans, Fire Suppression System, 40-Element Filtration System. Spray Zone Finishing “Spray-Tech” 10’ x 18’ (Inside Dimension) Enclosed Spray Booth w/ Filtration System, Blowers, Lights, Fire Suppression System, Paint Pots and Guns. Donaldson Torit “Power Cone” Dust Collection System w/ CPC12 Hopper and WSP Dumpster. 1998 Onsrud mdl. D025 Inverted Router s/n 3091006 w/ 30” Throat, Extended Work Table. Tegle &amp; Sonner Tilting Arbor Spindle Shaper s/n 67869 w/ 35” x 42” Table, Fence System. 2006 Lobo mdl. WP-2000 20” x 7” Planer s/n 200112. Robland mdl. XSD 12” Jointer w/ Fence System. Legacy mdl. 1800 Ornamental Mill w/ Acces. AMT mdl. 4370 12” x 36” Wood Lathe w/ Acces. Kreg mdl. DB210 Pocket Hole Machine. Denray mdl. 3444B SUPER 34” x 44” Down-Draft Table. (2) Powermatic mmdl. 075 Portable Dust Collectors. Infratech “Super Speed Ray” Infrared Drying Lamp. Pacco 4” Edge Belt Sander w/ 12” x 49” Tables and Corner able. Butler “Tidy 30SP” 30Hp Rotary Air Compressor s/n 26724 w/ Digital Controls. Macair “Drymax” Refrigerated Air Dryer. Napa 10Hp Horizontal Air Compressor w/ 120 Gallon Tank. Pedestal 6” Belt / 12” Disc Sander. Large Quantity of “In-Process” Furniture and Decorative Goods. Large Quantity of Ornamental Trim and Molding Products Including, Architectural Details, Bases, Capitols, Cartouches, Centers, Columns, Corbels, Corner Elements, Drops, Festoons, Finals, Friezes, Keystones, Moldings, Onlays and Rosettes. Clark GCX25 4125 Lb Cap LPG Forklift s/n GX230-101- 9085 w/ 3-Stage Mast, 188” Lift Height, Side-Shift, Solid Tires. Ingersoll Rand 185/90 Towable Diesel Air Compressor s/n 122651-U81- 957 w/ John Deere Series 300 Diesel Engine, 185 CFM @ 110 PSIG, 1364 Hours. 2005 JLG mdl. 248 “Power Deck” Hydraulic Drop-Down Trailer s/n 0050002253 w/ 3710 Lb GVWR, 3154 Lb GVWR @ Axel, 2200 Lb Cap, VIN# 5DYAA141X6C002215.